The Crucifix which is the Parish 1914-1918 War Memorial and which had been in the Narthex of our Church since 1975, was taken down in summer 2014 in order that it could be restored and renovated in time for Services marking the 100th Anniversary of the First World War . The Memorial was re-dedicated and a new plaque with the names of all 25 men who gave their lives for us blessed by Bishop Richard Moth, Bishop of the Forces at a service on 9th November. We were honoured that The Mayor and Mayoress of Tunbridge Wells, Cllr Julian and Mrs Ann Stanyer, The Deputy Lieutenant, Peter Blackwell, and the Rt. Hon. Greg Clark, MP for Tunbridge Wells also attended. Among the congregation were family members of some of the men listed on the plaque. After the Mass there was a reception in the Hall. Many parishioners were involved in the rededication - the War Memorial team came up with the original idea. 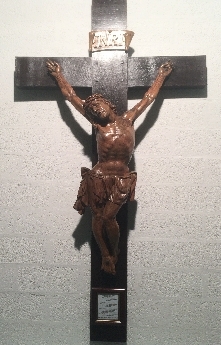 Ann Jenner renovated and restored the Crucifix so beautifully. The team of 'slaves' who helped reposition the crucifix. Everyone involved with the service itself. The entertainment team who made the delicious refreshments and made the Hall look so inviting and the office for printing off the order of service. The Memorial for those parishioners who had died in the War, was originally dedicated and unveiled on 11th December 1918 by Bishop William Keatinge, the Chaplain-General of the Forces, and the Mayor of the Borough of Royal Tunbridge Wells, Mr. (later Sir) Robert Gower, just one month after the Armistice of 11th November. It was almost certainly the first World War I Memorial to be unveiled in Tunbridge Wells and could well be the very first World War I Memorial in the whole of Britain. It was originally placed on the outside wall of St. Augustine's Church, at the junction of Grosvenor Road and Hanover Road. It remained there until 1969 when the church building was sold, as it was far too small for the Church's congregation. It was moved to St. Augustine's new church in Crescent Road, and placed indoors in the narthex of the Church, where it has remained to this day. Unfortunately, at the time of the demolition of the Grosvenor Road church in 1969, the plaque on the Crucifix which listed the names of all who had died, was lost and has never been found. It has now been replaced. BELOW ARE THE NAMES OF THE 25 MEN WHO GAVE THEIR LIVES THAT WE MAY BE ALIVE TODAY.